Are you ready for battle? Indeed, fans from both sides of the camp are gearing up for what is predicted to be one of the biggest demand for tickets this concert season. Are you prepared for “WORLD WAR JOY” ? The explosive hits of The Chainsmokers & 5 Seconds of Summer will be dropping bombs of excitement as their headliner arena tour spans 41 cities in North America. 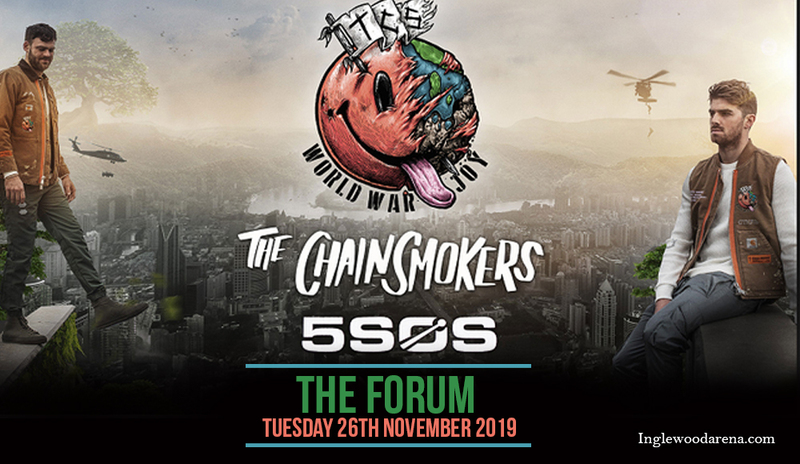 And yes, they'll be closer than ever as they are headed this side of town for a one-night-only concert showdown at The Forum on Tuesday 26th November 2019. Don't let this #selfie or better yet, groufie moment slip out of your fingers. Get a grip on those tickets as they're said to be moving and selling out pretty fast. Catch it while you can. Book your tickets now! This lethal combination of The Chainsmokers & 5 Seconds of Summer in one concert headliner stage is said to be a bit controversial among fans. Yet both superstars have nothing but the best intention, which is to spread the love through their upcoming tour dubbed as 'World War Joy'. Both of them are equally loaded with ammunition of hit songs that would surely trigger bursts of euphoria from their most ardent fans. And then there's that exciting duet for the single “Who Do You Love,” that will bring both The Chainsmokers & 5 Seconds of Summer, onstage. One of the biggest breakout artists in recent years is The Chainsmokers. 'But first, let me take a selfie…' was their banner song that brought everyone to lift their hands up in the air…and click #selfie! Their songs are now anthems of this generation. Then came “Closer,” featuring Halsey, which went on to become the longest running #1 single of 2016 on the Billboard Hot 100 chart. Other equally massive follow-up hit singles include “Roses,” featuring Rozes, “Don’t Let Me Down” featuring Daya, among others. A.k.a. 5SOS is a boyband-playing instruments. Luke Hemmings (vocals/guitar), Michael Clifford (vocals/guitar), Calum Hood (vocals/bass) and Ashton Irwin (vocals/drums), have become the poster boys of rock meets boyband pop. Hailed as the “biggest new rock act in the world” by Rolling Stone, 5SOS has proven their chart-topping power as the album Youngblood and its title track has accumulated close to 2 billion streams worldwide. In no time, they have pocketed distinguished awards and citations which include an American Music Award, a People’s Choice Award, an iHeartRadio Music Award, five MTV European Music Awards, two ARIA Awards and an MTV Video Music Award. World War Joy is coming. Assemble your troops and arm yourselves with tickets to the show. Book those tickets now!